You wait nearly two centuries for a distillery to open in the Borders, and then three threaten to spring up almost at the same time. 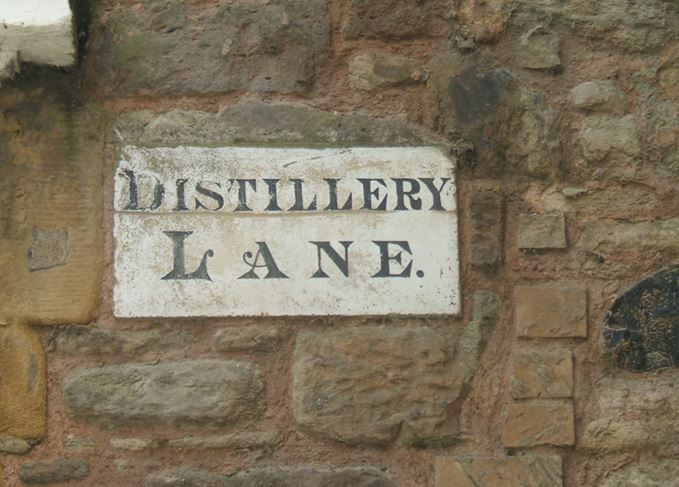 But which will be the first to restore whisky-making to the area? Gavin D Smith checks out the runners and riders. The final vestige of the last Borders distillery in Kelso, which closed in 1837. It has taken 46 years for the Scottish Borders to get its only rail link restored, following the infamous Beeching cuts of the 1960s. The revived line between Edinburgh Waverley and Tweedbank was officially opened by HM The Queen on 9 September 2015. That is as nothing, however, compared to the time lapse regarding distilling. The last (legal) Borders whisky was made in Kelso in 1837, but now three separate projects are vying to remedy that situation. Potentially the most ambitious in scope is planned for the site of the former Jedforest Hotel, five miles south of Jedburgh, and adjacent to the cross-border A68 trunk road. This project is in the hands of Mossburn Distillers Ltd, which is currently in the process of developing Torabhaig distillery on the Isle of Skye. Mossburn is headed by chief executive Neil Mathieson, who established spirits importer Eaux de Vie in 1984. Eaux de Vie is now owned by Marussia Beverages BV, which in turn belongs to the Swedish investment company Haydn Holding AB. Marussia operates vineyards in Europe and a brandy distillery in Eastern Europe, as well as working with Caribbean rum producers, so getting involved in Scotch whisky distilling seems a logical next step. Mossburn’s Borders distilling venture is to be no bijou, ‘artisanal’ operation, however, as £35-40m has been earmarked for its creation, announced with great fanfare early in 2014. Since then, things have gone rather quiet, as Mathieson explains. “We discovered difficulties with plant engineering as we scaled everything up. We had to re-plan, and we are now going for two separate distilleries on the same site: one containing column and pot stills to make grain and malt whisky, and a second one with smaller pot stills and hybrid stills. Both distilleries will produce malt, grain and neutral spirit. Mossburn has a fully-funded 25-year business plan for its Borders distilling project, which means that there will be no sales of new-make spirit to generate income and no ‘founders’ casks’. The Three Stills Company will transform this brownfield ste in Hawick into a modern Lowlands-style Scotch whisky distillery. Some 10 miles from Jedburgh, in the Teviotdale mill town of Hawick, a second Borders distilling project has recently achieved a crucial funding target, with a vacant property earmarked for its distillery. The Three Stills Company (TTSC) was created in 2013 by four former directors of William Grant & Sons: George Tait, John Fordyce, Tim Carton and Tony Roberts. The former Turnbull & Scott heating systems premises on Hawick’s Commercial Road has been identified as the production site, with visitor facilities to be developed alongside it. After hovering below the radar for some time, TTSC hit the local headlines in November 2015 when it announced that £10m of funding had been secured, with money coming from the Edinburgh investment company Badenoch & Co, owned by Malcolm Offord, from members of the Ballande family who have extensive commercial interests in France and Asia, and from Swiss investment group Drake Enterprises. Closer to home, the UK’s largest private landowner, the Duke of Buccleuch, has also become an investor. Planning permission for the development will be sought in early 2016 and, according to project leader John Fordyce, it is hoped the distillery will be operational at some point during 2017, with gin and vodka being produced and marketed while the whisky matures towards release. TTSC already sells Clan Fraser blended Scotch whisky in a number of export markets. Alasdair Day is hard at work to establish two distilleries in Raasay and the Borders simultaneously. Last but not least of the would-be Borders distilling trinity is R&B Distillers, headed by businessman Alasdair Day and financial backer Bill Dobbie, founder of web dating site Cupid. Day’s whisky heritage dates back to his great-grandfather Richard Day, who worked for a whisky blender in the Borders town of Coldstream back in 1895. Day launched The Tweeddale Blend in 2009, and has subsequently added to his portfolio of whiskies, including a Borders Single Grain, launched in November 2015, while R&B Distillers was established to create distilleries on the small Hebridean island of Raasay and at an unspecified location in the Borders. The Raasay project is expected to be completed during 2017 and, much as Mossburn Distillers plans to turn its attention to its Jedburgh venture once Torabhaig on Skye is up and running, so R&B will focus on the Borders once Raasay is on stream. Having initially identified a former water mill in the village of Walkerburn, near Peebles, as a potential home for their Borders distillery, R&B then opened an online poll in which participants could vote for one of several locations, with the town of Peebles easily coming out on top. “We launched the poll because we wanted to be clear that we do not yet have a site in the Borders and wanted to ask people where they thought a suitable location would be,” Day explains, adding that the Walkerburn site was a non-starter “due to the expectation of the landowners”. The Borders distillery will be around the same size as Raasay, making about 94,000 litres of spirit per annum. And the style? “Lowland, light but with some sweetness and floral, cereal notes to reflect the gentle, green rolling hills, farmland and rivers of Borders would be good,” says Day. So who will be first to restore whisky-making to the Borders? The smart money would probably be on Three Stills, with an existing property ready for conversion. But whoever wins the race, for the time being at least Borderers can now catch a train to visit other Scottish distilleries while they wait. Plans have been approved for the first distillery in the Scottish Borders for almost 200 years.